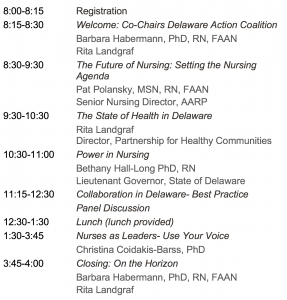 The Delaware Nursing Summit is the critical next step for the Delaware nurses as we join 50 Action Coalitions across the country, all working to meet the goals identified in the landmark IOM report, The Future of Nursing: Leading Change, Advancing Health. With over 16,000 nurses in Delaware, we have a powerful voice that must be heard. This summit will give Delaware nurses a chance to examine the opportunities and barriers that exist as we work to improve health and health care delivery in our communities. We want nurses from all practice arenas to bring their unique voice and commitment to the table to support a common goal, transforming health and health care in Delaware. Join the movement as nurses from across disciplines come together and take action for the future health of all Delawareans.